Volume is the quantity of 3-D space enclosed by a closed surface, for example, the space that a substance or shape occupies or contains. Volume is often quantified numerically using the SI derived unit, the cubic meter. 1 litre = 10 (cm)³ = 1000 cubic centimetres = 0.001 cubic metres. Volume is measured in “cubic” units. The volume of a figure is the number of cubes required to fill it completely. The volume of a cube = side times side times side. Since each side of a square is the same, it can simply be the length of one side cubed. If a square has one side of 5 inches, the volume would be 5 inches times 5 inches times 5 inches, or 125 cubic inches. Cubic inches can also be written as in³. Be sure to use the same units for all measurements. You cannot multiply feet times inches times yards, it doesn’t make a perfectly cubed measurement. 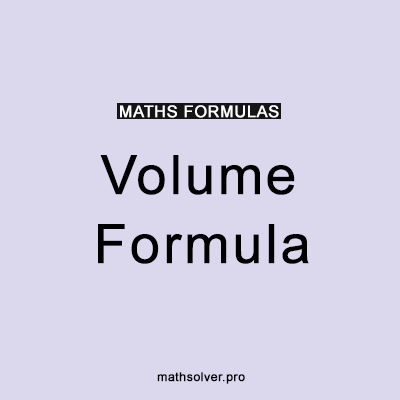 There are some formulas which you need to keep in mind while calculating the volume. For example, the volume of a shoe box a parallelepiped that is 3 inches by 2 inches by 12 inches is 3 x 2 x 12 = 72 cubic inches. This means that it would take 72 cubic inches to fill the shoe box.